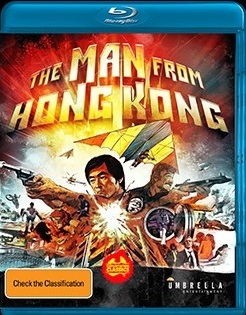 Home / 70's / The Man From Hong Kong Coming To Blu-ray!!!! I am so excited to be talking about this. I woke up this morning not feeling very well. I watched a little tv and then I came into my office to do a little bit of research and writing when I happened upon this article on Bloody Disgsusting where they were talking about The Man From Hong Kong, a 70's Ozploitation film directed by Brian Trenchard Smith, who gave us Stunt Rock, Dead End Drive-In, Night of the Demons 2, and Leprechaun 3 &4. Most of Smith's films have made it to dvd and/or blu-ray in some fashion, but The Man From Hong Kong has been elusive. There was a release dvd release in 2002, but that was it. It seemed like the film had been forgotten about. Now we are getting the blu-ray release that we deserve. Umbrella Entertainment (located in Australia) has announced that, not only are they bringing the film to blu-ray, but they have remastered the film in 4K. The prior dvd looked ok, but left a lot of room for improvement. Umbrella remastering the film in 4K is great. Even if they had remastered the film in 2K fans would be happy. executive producer DAVID HANNAY and second-unit cameraman JOHN SEALE. -Exclusive 24 page booklet featuring stills and a new discussion of THE MAN FROM HONG KONG by Brian Trenchard-Smith PLUS an excerpt from his new novel THE HEADSMAN'S DAUGHTER. Keep in mind that the bonus films included here are in standard definition only, but when the films are a bonus the fact that they are not in HD is not a huge complaint. Also, this release is an Australian only release, usually that means that you would have to be region free or have a region B blu-ray player. This release, however, looks to be region free, as that is how it is listed on Umbrella's website. You can order the blu-ray through Umbrella's website: https://www.umbrellaent.com.au/movies/2872-man-from-hong-kong-blu-ray.html and I am sure that other sites will be carrying it as well. Also, remember that Arrow Video is releasing Smith's Dead End Drive-In on blu-ray on September 20th. That release looks to be packed as well.